Market volatility continued in tandem with the first monthly rally of the Russian ruble since October. The Moscow Exchange (MOEX) has disclosed its trading volumes for the month ending February 2015, which saw a rise across its foreign exchange (FX) market turnover, negating a double digit retreat last month, according to a MOEX statement. In February 2016, the total FX market turnover at MOEX climbed to RUB 30.5 trillion, rising 10.1% MoM from RUB 27.7 trillion in January 2065 – this included spot trades of RUB 12.4 trillion and swap trades coming in at RUB 18.1 trillion in February 2016, each higher MoM than their January 2016 counterparts. The picture was even more optimistic when measured against its 2015 equivalent however, as MOEX secured a solid YoY growth across its FX volumes, with February 2016 constituting a surge of 55.6% YoY from just RUB 19.6 trillion in February 2015. Furthermore, MOEX’s FX market’s average daily turnover in February 2016 was $19.6 billion (RUB 1,450.8 billion), falling -5.9% MoM from $20.9 billion (RUB 1,541.4 billion) in January 2016. 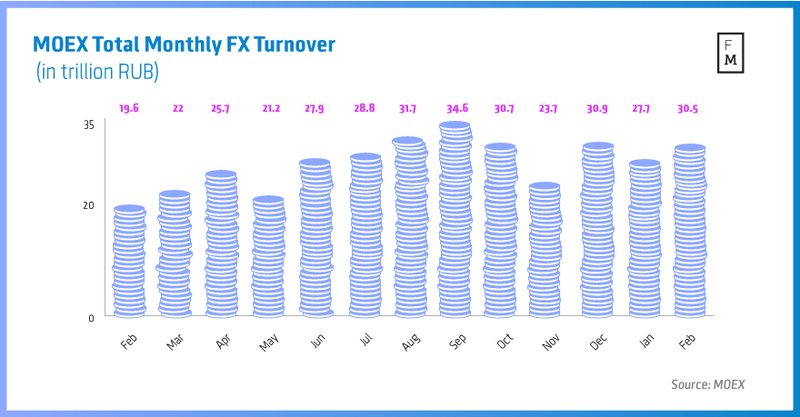 Compared with last year however, February 2016’s FX market turnover did move notably higher by a margin of 40.8% YoY from $13.9 billion (RUB 1,030.7 billion) in February 2015. Finally, MOEX’s derivatives market volumes did build on a strong January performance by catapulting higher in February 2016, reporting a figure of RUB 13.4 trillion for the month – this corresponded to a rise of 26.4% MoM from RUB 10.6 trillion in January 2016. February 2016’s turnover is also higher than the same period in 2015, having registered a climb of 103.0% YoY from just RUB 6.6 trillion in February 2015.